To Mike Huber, Aaron Judge’s decision seemed like a simple math equation. Huber, Judge’s high school football coach, had seen the offer letters flow in from the likes of Notre Dame, Stanford and UCLA. He figured that four or five years at any of those schools, plus room and board, would have to amount to nearly $1 million. But Aaron Judge didn’t want to play football, so he skirted those full scholarships in favor of a partial ride to Fresno State to play baseball. “Those were some pretty animated conversations,” Huber says now. Judge had grown up a baseball player, but as he’d grown into a 6'6", 205-pound sophomore at Linden (California) High School, some other coaches coveted him for their squads as well. Fortunately for Huber, he was a friend of Aaron’s adoptive parents, Patty and Wayne Judge. With their blessing, he tried out Aaron—then a pitcher—at quarterback. But as many two-sport athletes discover, the motions for pitching and throwing a football are completely different. In football, quarterbacks rely largely on their body and their wrist. Throwing a baseball is more about shoulder strength and finger position on the ball. It’s hard to imagine now, with Judge a burgeoning star in the Bronx—leading MLB in home runs (30), slugging (.691), WAR (5.3), offensive WAR (4.8) and runs created (94)—but he did have one athletic weakness in high school. And Huber found it. Huber allowed Judge to develop for a year on the JV team before calling him up to varsity as a junior. As the No. 2 option behind senior Beau Slaton (who once recorded 282 receiving yards in a single game), Judge finished his junior season with 32 catches for 446 yards and four touchdowns. Alvarez was also Judge’s point guard in basketball. They had both made varsity as sophomores, and that year, when Alvarez saw Judge battle with future UCLA player Reeves Nelson (who attended nearby Modesto Christian) and put up a double-double, he knew his friend was college-bound in one sport or another. In his senior season, Judge averaged 18.2 points and 12.8 rebounds a game. Judge would also use his size to his advantage in extracurricular athletic endeavors. At Alvarez’s house one day during his senior year, the football team thought it would be funny to have the smallest member of the team, a 5'5" corner named Cody St. John, wrestle the largest member of the team, Judge. When the match started, Judge lifted St. John up with one hand and dropped him onto the ottoman in the living room, snapping the wheels off the furniture. When they played Nerf basketball on Alvarez’s indoor hoop, Judge would dominate the games, lording over the other players trying to get to—or stop him from getting to—the eight-foot rim. Alvarez, who also ran track, managed to beat Judge out for athlete of the year when they were juniors, but Judge swept the awards their senior season. The football, basketball and baseball teams each selected him as their MVP, and The Record named him an All-Area selection in each sport. Huber watched glowingly from afar as Fresno State flipped Judge from pitcher to infielder and outfielder. The only exception to his rooting interest came when Judge played winter ball in Cape Cod. Huber, a lifelong Yankees fan, would scowl when Judge sent him a picture of himself in a Red Sox cap. When the Yankees drafted Judge 32nd overall in 2013, one of the first messages Huber sent him was to burn that hat. Although Huber remembers Judge’s parents at times wanted him to be traded—they were worried about Judge being stuck for an extended period in the minors behind Carlos Beltran—it became his dream to see Judge homer at Yankee Stadium. 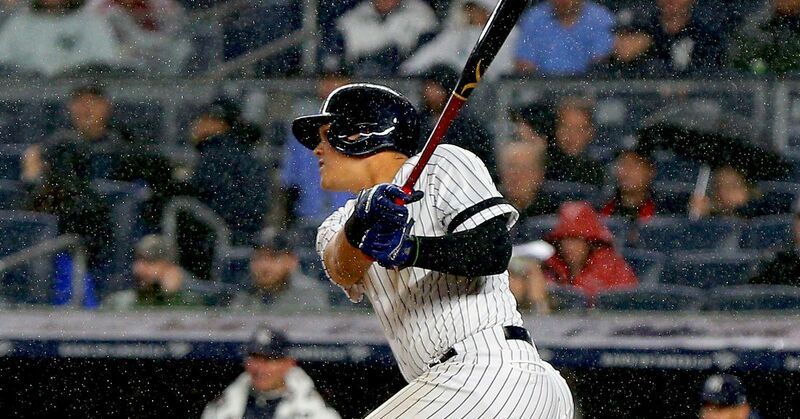 Once Judge was called up, it didn’t take long: He went yard in his first at-bat as a major leaguer, and the power surge hasn't let up since. When the Yankees visited the A’s in June, Huber took in the game from the stands. He says he rarely speaks to Judge during the season, as he knows Judge has enough attention already. And he knows that Judge’s success is due in part to sidestepping his coach’s advice.